In today's market, there are hundreds of laminators to choose from. It is no joke, and I completely understand the confusion often associated with buying a laminating machine. 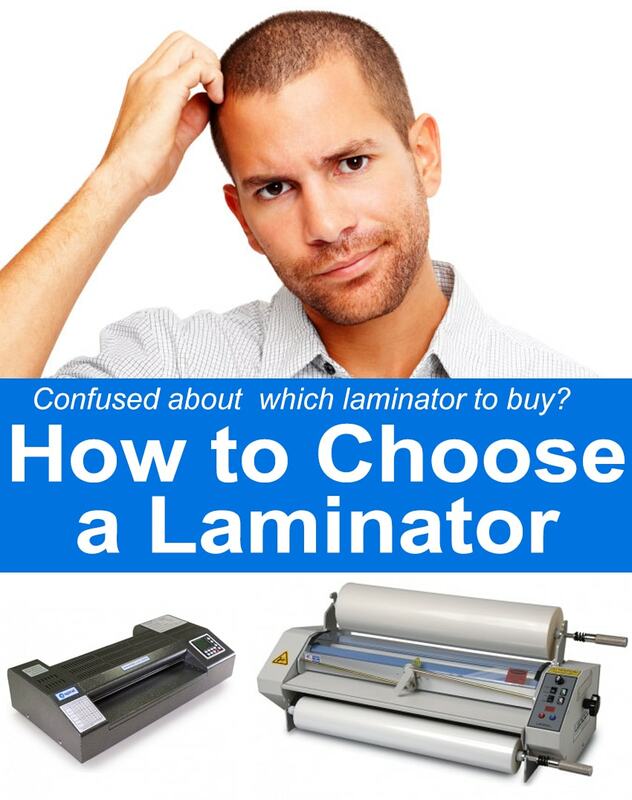 So I have put together this guide to walk you through how to choose a laminator. I will review the questions you need to ask yourself, as well as the different types of laminating machines available. With the information provided in this article, you should have a great starting point for buying a laminating machine -- but if you still need help, you can call our experts at (866)537-2244 for some one-on-one help. PLUS make sure to read to the end of the post to learn how to win a laminating machine for your school - a giveaway worth $525, and ending in August 2018. ① What is the largest size sheet you will be laminating? Pouch laminators are available in a variety of sizes, many being large enough to laminate product up to 11 ½" x 17 ½". Be sure to think about your current needs, as well as future needs, to ensure the laminating machine will be a smart choice for your future. Applications larger than this will typically require a roll laminator. ② What mil (thickness) will you be using? Many laminators are limited to running thinner lamination film, usually up to 3 or 5 mil. This film produces thinner, more flexible product. For thicker, more rigid results, a 7 or 10 mil film is necessary. Make sure the laminator you choose is advertised as handling the mil thickness that you will be using. ③ What is your volume? Because different laminators run at different speeds, and each are built to handle a certain amount of workload, your volume must be considered. Some laminators are faster than others even while still maintaining a high quality. Production speed may not matter for low volumes, however with high volume, saving seconds per unit can make a significant difference and help keep costs down. ④ What are you laminating? Some laminators are designed specifically for basic copy paper with only black print. Other laminators work well with photographs and full color digital prints. Some large format laminators can even laminate products up to 1/2" thick, allowing for mounting boards. There are certain features necessary for the different types of applications. Matching your needs with the laminator's functions is very important. ⑤ How much space do you have for the laminator? Pouch laminators are generally compact and used on tabletops. Some roll laminators can sit on a tabletop, however the majority are usually placed on their own stands or workstations. Keep in mind the location and space available when deciding on a laminator. Pouch lamination machines are the most popular and least expensive method of laminating. Pouch laminators are used to laminate applications from identification cards up to posters and signs. Pouch laminators apply heat and pressure to the laminating sheet fully encapsulating the document in a protective casing called a laminating pouch. These laminating machines are generally available in compact tabletop units designed for laminating applications from 4” up to 14" wide. A Roll Laminator is a hot or cold lamination machine that uses rolled film to encapsulate and protect documents larger than you would be able to accomplish with a pouch laminator. Roll laminators are designed for higher volume runs & are typically used for two sided laminate. With a maximum laminating width typically at 27", a roll laminating machine is perfect for laminating posters, maps, book covers, signs, photographs, charts, and much more. They will allow for high production rates, are durable, and allow your application to be wiped clean. Many roll laminators can also handle mounting documents of several different thicknesses and on a variety of mounting boards. Cold Laminators, also known as pressure sensitive laminators, make laminating easier than ever. This type of laminating applies a film or adhesive to the application using high pressure rollers. This process requires no electricity, eliminating warm-up/cool down time and adjustments to tension and temperature. The cold laminators are extremely user friendly; perfect for home, schools, offices, and more. Pressure sensitive (cold) laminate is sticky to the touch, and features a removable release liner that covers and protects the adhesive. Wide Format Laminating Machines are ideal for use with large applications such as promotional signs & banners for trade shows and other presentations. All wide format laminators are floor standing models, (some can be placed on a table) and can handle documents anywhere from 42" to 63" in width. We're offering our first ever giveaway, and are so excited to share that it is for an amazing pouch laminator for a school. The lamination unit is called the Sprinter-Lam, which retails for $525, and is made by the world-famous Spiral James Burn! There is no purchase necessary to enter, just submit the school you want to nominate at the below link. Show the educators that made a difference in your life how thankful you are by nominating their school to win this free laminating machine.